.. the U.S. Federal Statistical System offers a vast array of diverse data resources that are useful in wide-ranging planning and analytical applications. Many of these data resources, such as census block level demographics from the decennial census, are unique in scope and content; in many cases there are no alternative data resources. But there are issues/challenges for the data user to navigate the Federal Statistical System. Examples … the Bureau of Labor Statistics releases total employment data by county quarterly and monthly through multiple programs. The data values differ, for methodological reasons, but the net result can be confusion. The Census Bureau releases total employment data from many statistical programs by county both annually and more frequently. Where are these alternative total employment data and how can they be accessed? How do these various measures differ and which data are right for my situation? This section provides basic statistical program information. Subsequent updates will provide more detail. See the related Web section for more information. — click to view agencies, programs, data. This section provides an overview of the U.S. Federal Statistical System (FSS) and information that can help stakeholders navigate access to selected types of data produced by the FSS. While the FSS is focused on agencies that collect, develop and make available statistical data, there is a broader set of data and resources that relate to accessing and using these data. As technology and related data analytics resources have evolved, access to and use of these data is closely associated with the development of geographic data by Federal statistical and other agencies and Geographic Information Systems (GIS). The FSS is a decentralized set of agencies that collect, develop and make available statistical and geographic data. The OMB Office of Statistical Programs and Standards (SPS) provides a FSS coordinative role. The SPS establishes statistical policies and standards, identifies priorities for improving programs, evaluates statistical agency budgets, reviews and approves Federal agency information collections involving statistical methods, and coordinates U.S. participation in international statistical activities. While the above agencies are classified as the “principal statistical agencies”, there are many other agencies that produce statistics that might be as much or more relevant to your needs. See this table that lists statistical programs and resources organized by producing agency. New and updated Federal statistical data evolve daily. The Navigating the U.S. Federal Statistical System resource is frequently updated. Census block data are important to demographic/market analysis in part due to the data being counts of population and housing units rather than estimates (subject to errors of estimation). Block data are also important due to their geographic granularity, very detailed geography. Block data provide a good way to aggregate small area demographics into territories, markets and service areas using GIS tools. We have not only demographic data for blocks but also their geographic attributes: location/boundary and area. 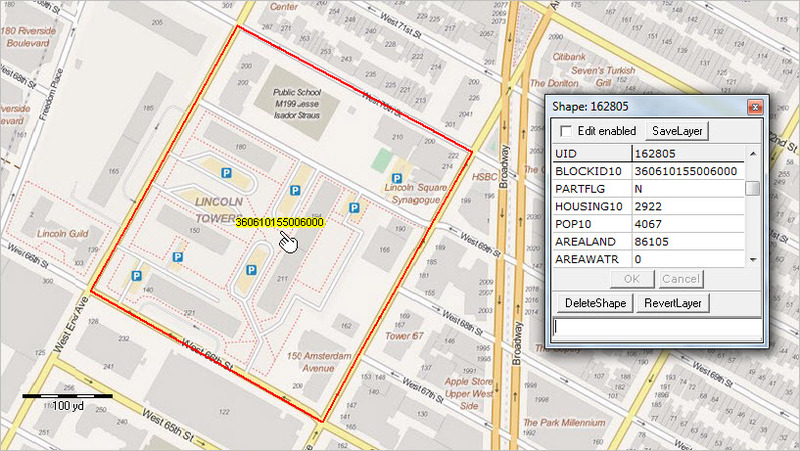 Make maps and perform geospatial analysis using census block shapefiles. Use census block geography with non-census data for wide-ranging analyses. The following graphic shows the NYC Census 2010 census block having the largest Census 2010 population that is not a group quarters population block. The Lincoln Center census block shown in the graphic (red boundary) has 4,067 population and 2,922 housing units. This block (36 061 015500 6000) occupies 0.033 square miles. It has a population density of 122,333 (population per square mile). The NYC block with the largest population is on Rikers Island and has a group quarters population of 8,634 and 0 housing units. For Census 2010, there were 350,169 census blocks covering the state of New York; 13,356 census blocks were water blocks. For the State of New York, as of Census 2010 the average census block population was 55 (57 excluding water blocks). More about census blocks. In built-up urban areas, a census block often shares a boundary with a conventional 4-sided city block. Census blocks are normally bounded by roads and in some cases other types of physical boundaries. For Census 2010, each census block is coded as urban or rural; this is the basis for defining urban or rural population and geographies such as urbanized areas. 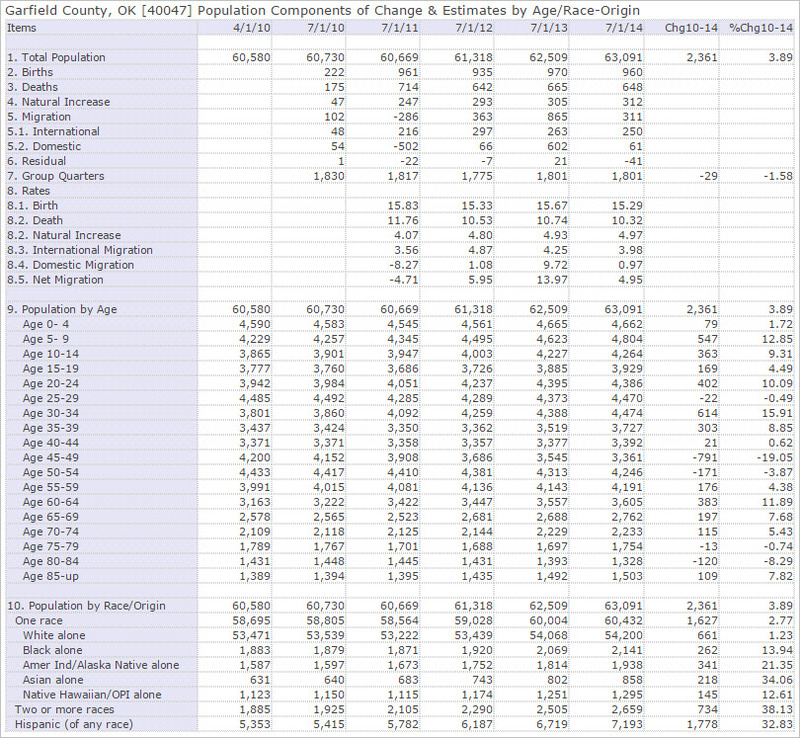 See urban population and urban/rural ZIP Codes. Census block geography nest within block groups and census tracts. Upcoming sections will focus on accessing, integrating and using New York City block group and census tract demographic-economic data. Unlike census blocks, annually updated demographic-economic data are available for block groups and census tracts from the American Community Survey. .. it has always been that an important first step in Data Analytics was developing or acquiring the key data to be analyzed. Having the right subject matter data for the right geography and time frame are essential prerequisites. The Internet and pervasive expanding needs and solutions for data integration has made Data Analytics easier and more accessible — and often more technically challenging. The Data Analytics Lab, reviewed here, offers a foundational and support framework to address the continually evolving Data Analytics needs. See more about the Data Analytics Lab in the related Web section. Data Analytics involves more than the ability to perform statistical analyses on data, though this is an important element. Data Analytics encompasses a spectrum of data and the ability to develop, access, integrate and effectively use those data. The platform of data on which we operate is constantly in change. New and different types of data emerge. Older data become obsolete. Required subject matter are often not available at the required geographic granularity. Often the biggest challenge is in linking data for analysis. GIS software is one on many Data Analytics tools. It is an important tool for many reasons. One main reason is the enabling ability to flexibly visually examine subject matter for different types of geography simultaneously. 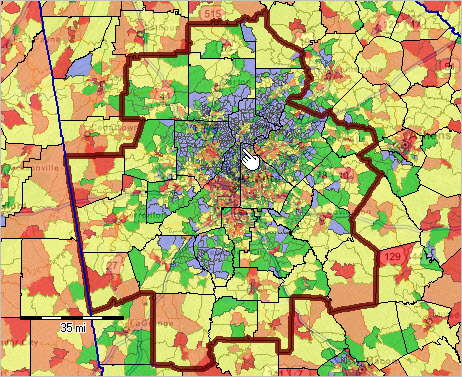 The following view shows patterns of economic prosperity in the Atlanta region (metro shown with bold boundary). The thematic pattern is median household income by block group. Higher income areas are shown in blue/green and lower income areas are shown in orange/red. Counties are shown with black boundaries. The next view is a zoom-in to the pointer location in the map shown above. This view has a higher transparency setting enabling a see-though effect to view highways and related ground infrastructure. 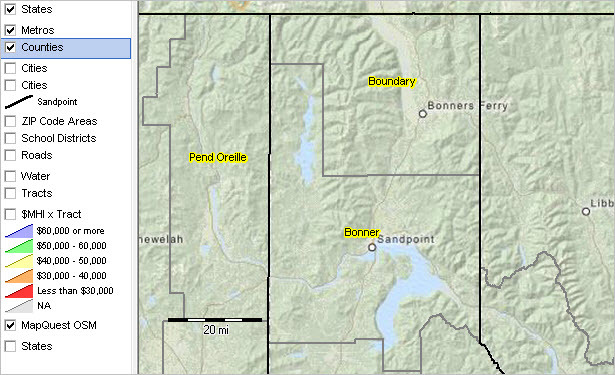 Block groups appear with black boundaries. The pointer is at the county boundary, a slightly bolder boundary. Data Analytics Labs (DAL) help participants develop a capacity to create map views like those shown above and perform geospatial analyses. This is more than learning how to operate GIS software; more than how to acquire shapefiles and build a GIS project. It is about selecting and acquiring the right subject matter data and then integrating those data with geometry (shapefiles, etc.) and assembling the composite files for analysis. DAL learning enables participants to develop informative and relevant maps view — and the right types of different geographies (including vintages) to use. Data Analytics Labs are set up within universities, government agencies and not-for-profit organizations to address these needs. Contact us to discuss how a Lab can be developed within your organization. A Data Analytics Lab provides tools/resources for hands-on data analytics applications. In a university setting, the Lab can be open to MBA, MPA, MHA and other graduate students plus multi-disciplinary faculty/researchers. Also in the university setting, some parts of a Lab can fit into existing classes and mesh with other existing programs. There is no physical lab; it is a virtual lab. The resources and vision are initially focused on Census-type geographic-demographic-economic data, expanded to selected Federal statistical data, and how these and primary data are knitted together for analysis and decision-making. There are no fees to participants. Tools and data are made available by ProximityOne — http://proximityone.com. Forthcoming sections will review examples of Data Analytics Labs, how and where they are operating and experiences of participants. .. As of 2014, there were 19,509 incorporated cities/places in the U.S. 12,744 (65.3%) of these cities had a 2014 population of 2,500 or less; 15,834 (81.2)%) had a population of 7,500 or less. Rank, compare, query all cities using this interactive table. Examine change since 2010. This section illustrates how to examine more detailed characteristics for any one of these cities — irrespective of population size. 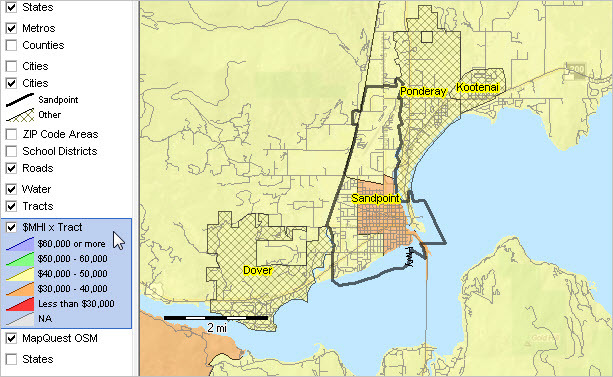 The following graphic shows a partial view of a demographic-economic profile for Sandpoint, ID. View the full profile here. Get a profile for any U.S. city. The profile shows demographic-economic attributes of Sandpoint based on American Community Survey (ACS) 2012 and 2013 5-year estimates. 2014 5-year estimates will be available in December 2015. The full profile tells a lot more about the city than only population by age. These attributes include school enrollment, educational attainment, migration, language spoken at home, employment status, employment by industry, income and wide ranging housing characteristics. Get the corresponding profile for the county or adjacent city. Compare attributes side-by-side. .. we often need data for study areas that do not conform to conventional political/statistical geography. The geography for a market, sales territory, impact zone or other type of study area often do not align with political or statistical geographic areas for which relevant demographic-economic data are available. While the interest might be in demographic-economic characteristics for a particular county, patterns and trends within a county cab vary widely for sub-county geography such as ZIP code areas, census tracts, cities, school districts and other types of geography. It is important to be able to examine the composite, or drill-down, geography for a larger area. Related geography are equally important. Even though primary interest might be in three ZIP code areas, knowing about patterns in related, contiguous ZIP codes is also important. This section illustrates how to examine semi-comprehensive demographic-economic characteristics and trends using organized profiles for alternative geography. 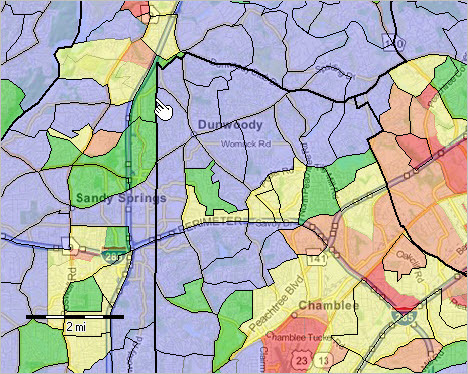 … in many cases tract boundaries are not coterminous with ZIP code. More information — get for your areas anywhere in U.S.
Illustrative set of different types of geography; Naperville, IL; Chicago metro. Click links to view full profile. 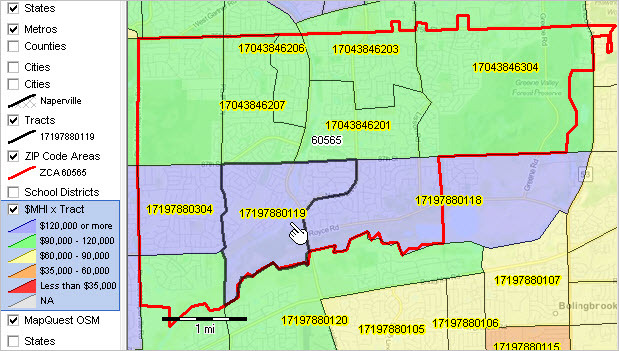 – ZIP code 60565 shown with red boundary. – Naperville city shown with semi-transparent cross-hatch pattern. There are many other ways to use composite and related geography in data analytics. GIS tools enable wide-ranging geospatial analysis not covered in detail here. See more about this topic in the data analytics program.